As mentioned in the article HERE, Google Voice has some great features. One of the features that can really help Canadians is the free long distance feature for calls to Canada and the US. There are some cell phone apps that will integrate with Google Voice to open up a relatively seamless way to get free long distance to Canada and the US from your cell phone. In this article, I’ll show you how to use your cell phone to have a call initiated online via the appropriate app. This method will allow you to use the mobile network (ie your mobile minutes) for the call. You will use very little data (a few kb) to simply initiate the call. When the call is initiated online, your cell phone will receive an incoming call and the person you are trying to call will receive a call as well. Google Voice will bridge this call for you. Most cell phone plans in Canada will charge long distance for outgoing calls made to areas outside of your local calling area. Many people look for other solutions, such as using a calling card or a paid service that requires calling into an access number or, in the worst case, simply not making long distance calls from their cell phone. None of these are an ideal solution to the problem as even the calling card solutions do not integrate well with your cell phone’s native dialer. 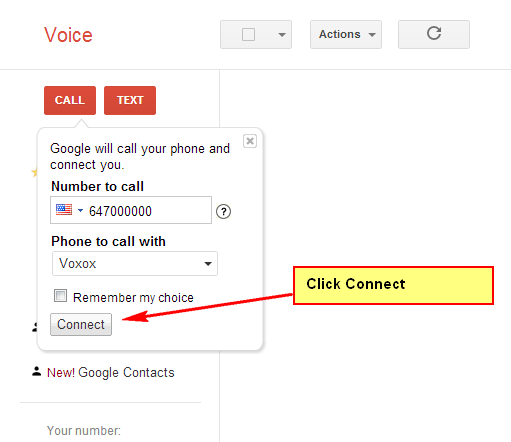 Now that you have Google Voice set up, as outlined HERE, I’ll show you how to get free outbound long distance calling from your cell phone. 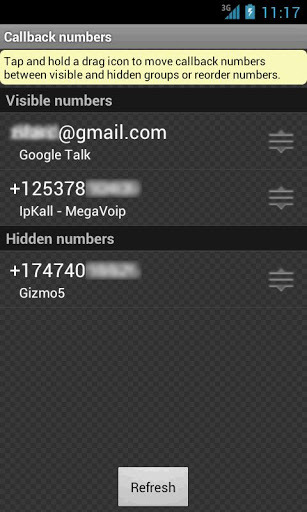 The calling card method has you dial into a Google Voice access number based in the US followed by you navigating the phone menus to make your call. This is called the Calling Card method since it works in the same way as a calling card. The callback method allows you to initiate the call online. 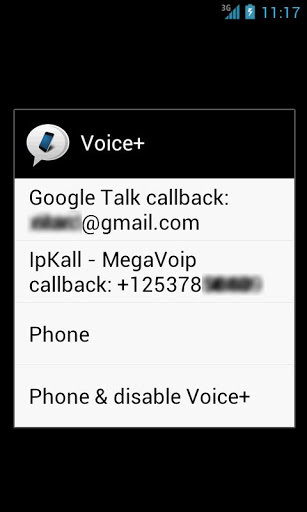 You inform Google Voice which of your own phones you would like to call from and who you would like to call. Google Voice will call your phone and when you pick that up, it will connect you to your desired recipient. 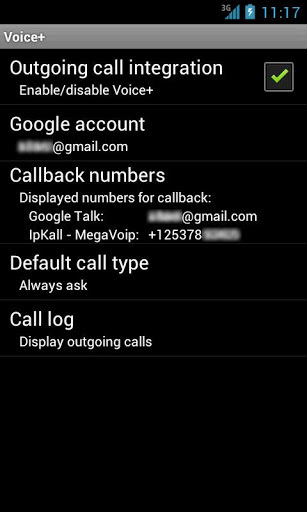 This is called the Callback or Click2Call method since Google Voice calls you back. We are going to make use of the Callback Method. This means that any calls using this method will appear on your cell phone bill as incoming calls. Pointster’s Pointer – Google Voice’s mobile site at m.google.com/voice appears to have a very nice dialer. Unfortunately, this will use the calling card method to route your call and you will incur the long distance charge associated with calling a US number. This defeats the purpose of what we are trying to do. Given that you have a data connection on your cell phone, the way to initiate your call is either through an app or through the browser. If you have an Android device, the app that I would suggest using is Voice+. It is a free app from the Android market. You can send it to your cell phone directly from the link. If you have a Canadian cell phone, you will not be able to download this from your cell phone’s Google Play store. You will have to “side load” it by clicking this link from a browser (preferably from a laptop or desktop computer). When Voice+ is turned on (you can turn it on or off if you like), you can place calls from your native dialer exactly how you would place normal calls. When you place a call, you will get a popup (see the 3rd screenshot) asking if you would like to use Voice+ (unless you have selected to always use Voice+ in Default call type). 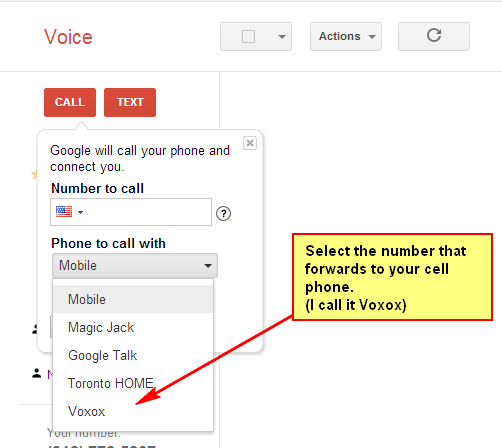 If you select Voice+ callback at the number that is forwarded to your cell phone, then Voice+ will call you back. When it calls you back, answer that call and your call will be connected (see the 4th screenshot). Pointster’s Pointer – For default call type, I prefer to have it ask me every time I make a call. If you have it use Google Voice every time, your Google Voice number will be displayed to your recipients (even if they are local) which may cause some confusion. 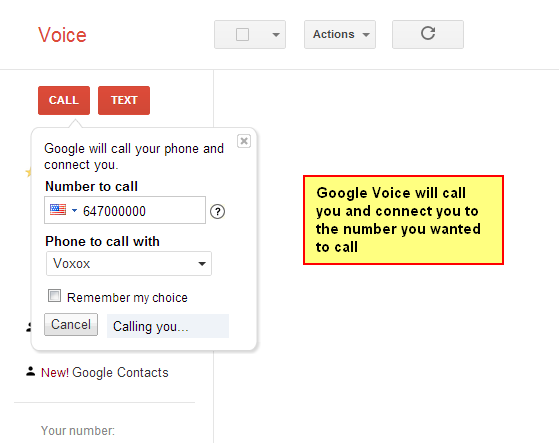 If you have unlimited incoming calls, then it might make sense to always use Google Voice. Pointster’s Pointer – I prefer to turn off the entire app when I am not using it, and only turn it on when I want to make a long distance call. If you have an iPhone, the app that I would suggest is GVConnect. This one costs $2.99 from iTunes. If you use the direct method, then your phone will call the US access number and you will pay the long distance charges associated with calling a US number. If you have a Blackberry or Windows Phone, you are going to be a little bit out of luck. 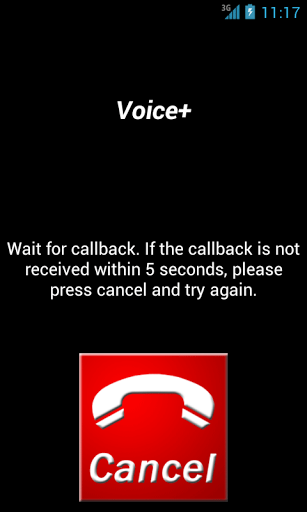 There are no real apps that I know of that cleanly integrate with callback feature. The quickest solution to this is to navigate to the website voice.google.com from your mobile browser. You will want to make sure that you use the full site, not the mobile site. The mobile site does NOT have a callback feature available. When you get to the full site, you will see there is the click2call application in the top left corner. Assuming your US based number is forwarded to your cell, your cell will receive an incoming call. When you answer it, your call will be connected to the outgoing number. If you don’t have a cell phone or want to make use of this from your landline in Canada, you will need to initiate your call from the desktop software, similar to how the Blackberry and Windows users have to. You simply need to make sure that your US based number forwards to your landline, instead of your cell phone. I suggested Voxox as a free solution to get a US based number, however, Voxox requires the forwarded (Canadian) number to receive a text message. If your landline can’t receive a text message, you will need to find another solution. Canadian landline users will perform the same steps as blackberry and other phone users by navigating to voice.google.com and using the dialer in the top left corner. Congratulations! 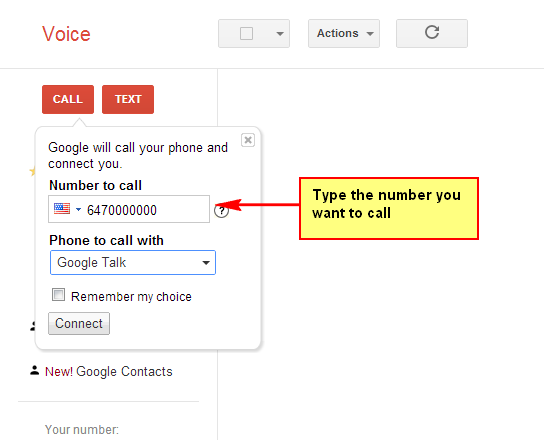 You can now integrate Google Voice into your cell phone for free calling to Canada and the US. All other users – Navigate to voice.google.com and ensure you are using the desktop site (not the mobile site). Initiate the call from the click2call widget in the top left corner. Go download the appropriate app for your cell phone now. It will take you about 2 minutes to connect your cell phone to your Google Voice account. VoIP services is one best options for long distance calling at nominal rates. by using mobile dialer apps you can easily use the VoIP services on your cell phone. The post is really awesome and useful for all cell phone holders. While you can also choose your calling card according to your calling destination. The post is very useful for all international callers. Don't subscribe All Replies to my comments Notify me of followup comments via e-mail. 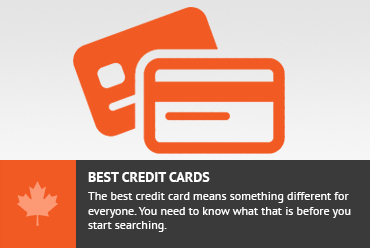 You can also <a href='https://www.creditwalk.ca/comment-subscriptions/?srp=167&srk=2648578ecea05c83754707575dc5a494&sra=s&srsrc=f'>subscribe</a> without commenting.